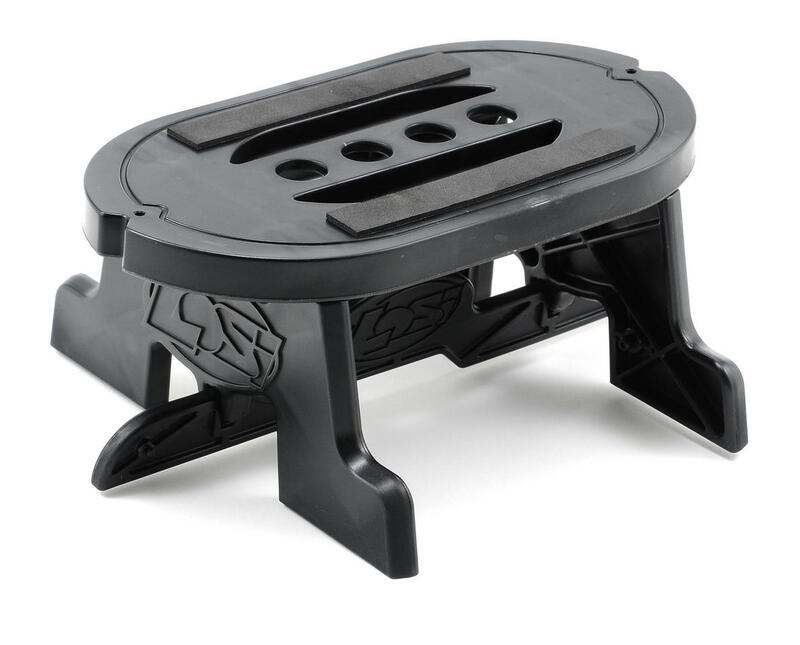 This is the Losi 8IGHT Car Stand, and is intended for use with the Losi 8IGHT and 8IGHT-T. The snap-together design makes it ideal for easy transport, and easy fit in your toolbox or pit box. The stand's no-slip design securely holds the chassis while you work, and the built-in shock holders prevent the shocks from rolling around during fluid changes. Excellent RC Stand, Excellent Price, Multi purpose, Quality superb, Losi did it again! no other RC stand better than this! Highly recommended for RC enthusiast! Easy fold up for mobile and storage, nice looking and eye cathing! my TLR 8E 3.0 wont leave the house without it! A W E S O M E !!!! Solid stand, top came off once and is a bit easy to come off. Otherwise my buggy sits very stable and I can freely rotate it. It is a quality stand and it is stable. I use it for all my classes. My problem with it is that it comes apart too easily. For example, if I move the stand on my bench, the top pulls off and the whole thing falls apart. I'm not sure if there is supposed to be more tension when it is assembled, but mine is loose and falls apart if you move it. I have had this car stand for a couple years now lol heck i cant even remember when i got it. It holds big bore shocks perfect and breaks down so you can store it in tight areas. Literally no complaints. It works great. The strengths are it holds shock bodies and it collapses and stays together very nicely. The weaknesses are that in order to use the shock holders you need to pop off the middle piece like you were dissembling it and that the feet don’t have grips on the bottom(it doesn’t slide very easily though). HUD108170 and PRO6257-00 are the only other stands I would consider. However, for $14.25, more than half the price of those two, this stand can’t be beat. Have used many alloy stands over the years & this design is MUCH better. Good for both 1/10 and 1/8 scale vehicles. Once the vehicle is placed centred on top of the stand it stays put & doesn't move like other stands which can be frustrating. Easy to clean, easier to build & breaks down to store with little space required. Looks the part at the track, at home on the bench or on the shelf. Can slide a bit when used on any smooth surface so I stuck rubber under each feet of the stand & it cured the issue. This is the best stand available & is so inexpensive. You can't go wrong no matter which RC brand name you prefer to run. This is a great stand. I have 2 of them now and I may buy another one. It folds up and fits nicely i your pit bag. I would recommend using a rubber band to keep if held together in storage though. This is a nice stand for the track. It folds flat for easy transport, has rubber strips on top plate, will update on how it holds up later. HATE Losi cars but the Losi car stand is great. Very strong and easy to use! 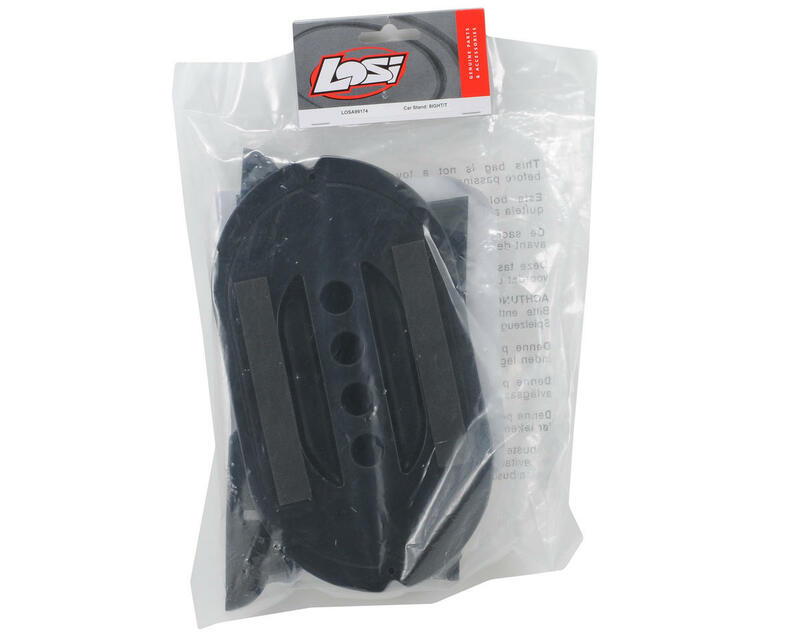 Pick up the camber and ride height gauge from Losi with it!